KTM has always been a company that has offered options and filled niches in the market. The 250XC is an off road oriented race bike while the 250SX is a Motocross bike. Also offered is the 250XC-w which is said to have a wider ratio transmission and be the most mellow version of the three. While these bikes differ in more ways than one, the head is an area where KTM can easily change the characteristics of one bike compared to the other. Altering the compression of an engine can do a lot to the power of an engine. The SX has higher compression than the XC, and the XC higher than the XC-w. Higher compression generally makes more power, but can also make an engine less reliable and/or less rideable if not done properly or kept in check. Elevation gain actually lowers compression, so the compression an engine makes will tend to be more of an issue for those that ride at higher elevations. Having these heads that are interchangeable factory options made a nice easy and safe way to give my 2010 KTM 250XC a power boost. I picked the head up for $164, add new o-rings for under ten bucks and some shipping and I was ready to go. The part numbers are almost identical, but do vary with one number. 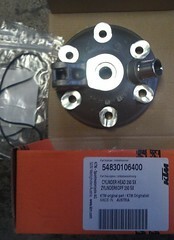 The 250 xc # is 54830106300, 250 sx # 54830106400, and the 250 xc-w # is 54830106200. 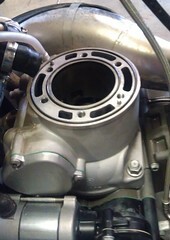 This really is an easy swap, just unbolt the old head and re-bolt and re-torque the new head. Be sure to get new o-rings any time you remove the head. Here you can see the difference in the heads. 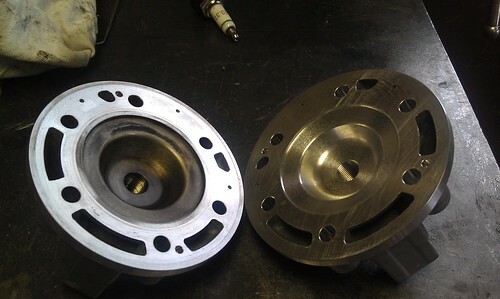 XC head on the left, SX on the right. 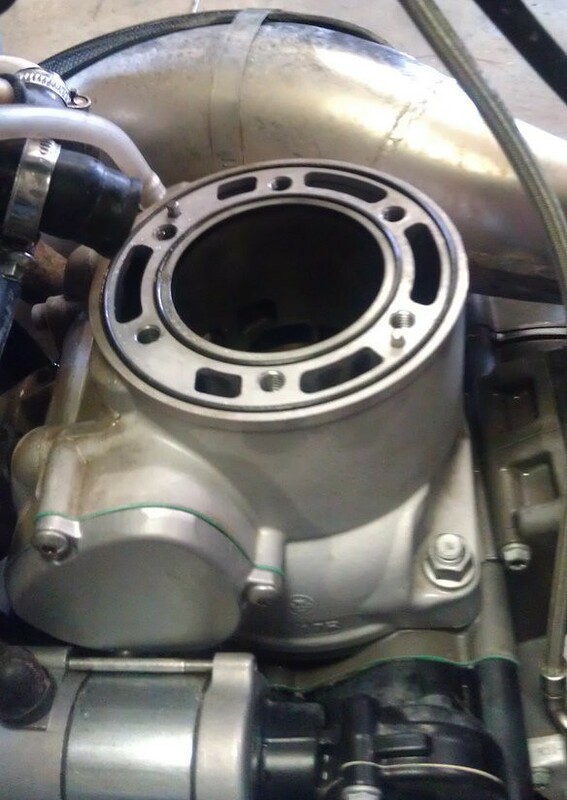 The shallow bowl of the SX head makes more compression. Top view. The SX head on the right has a deeper hole for the plug because of the shallow bowl. 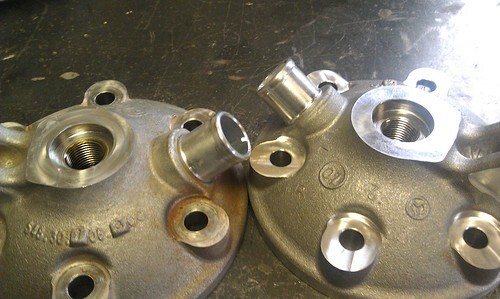 The casting is identical, just differences in machining. As I said, this was a really easy swap. My initial impressions of the bike is that the low to mid power of the bike has been improved while the top is pretty much unchanged. In reading what others have said, this is pretty much what can be expected. It should not alter the top end performance or change the reliability of the bike. The first wheelie I pulled off a curb almost resulted in going over so I know there is a boost there! The mid pulls stronger as well and still has a smooth consistent pull throughout. I'm anticipating having to use more throttle control in some cases, but I am definitely happy so far with the feel of the bike. I'm not anticipating switching back, but this is always an option since the stock head is not modified. This is a great upgrade that gives a big boost to low-end and mid-range performance and torque. 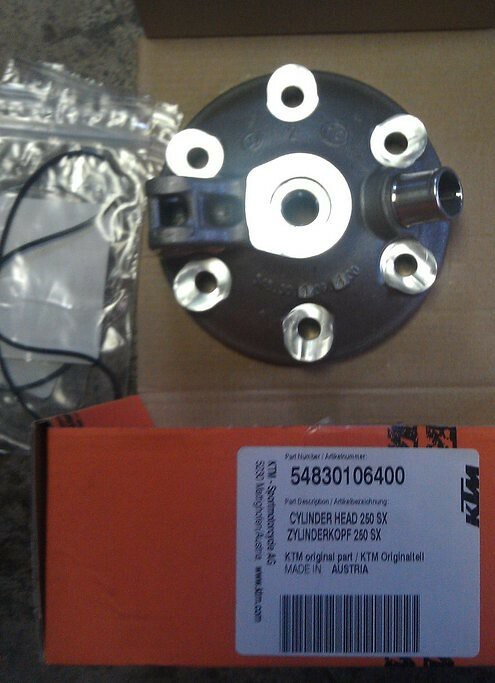 Thanks for sharing information regarding KTM 250SX Head Upgrade For The 2010 250XC. this information will be useful for customer to buy this motor bike. Tony, great write up on the head swap. You did a good job describing the power gains and whatnot. Your cost to upgrade however didn't include the speeding ticket you got while testing. What was that, 50 in a 30??? Haha! Yea..dang, that head ended up costing a premium. Still worth it though. :) you'll need to hop on sometime and tell me what you think.